The drum played a mighty role in carrying messages across the Rammoth. Ox hides were stretched over hoops of birch, giving a powerful voice to warnings and communiques meant for distant ears. The collective pulse of the people of Rammoth was echoed in the deep rhythmic language of the taämlin brought so long ago out of the north by the tribe of Telganan — for all young, male and female alike, were instructed in the ancient ways of the drum. On their first night in coming to the Valley, Telganan's hunters made the great fire Ianar which they encircled and made a toast to prosperity. They also perched their taämlins on end in a circle close to the fire so that the heads would heat up and become taught, for the evening's damp caused the skins to expand, making the drums unplayable. Each taämlin carried the sign of Ianar's flame, Rammoth's link with the heart of the Earth and the cauldrons of all beginnings. Once all the heads were ready, each hunter took his drum with the left hand and held it high to the heavens, giving a mighty shout in unison. Then, on signal, they brought the drums down to chest level and began playing a soft heartbeat. By weaving their own heartbeat into that of the forest, they appealed to the spirits of all living things that they came in peace, that the honor of Telganan was here to protect the grandeur of the land. And so it was in the early days of entering the Rammoth that Feldred, Telganan's most skilled hunter, divided the men of the tribe into four groups. One stayed behind to protect the women and children who kept the great fire Ianar alive. The other groups marched off to three directions of the Winds for a day's hunt, avoiding the dreaded North whence they had originally come, and all efforts were made to stay clear of Arbedil, the Unquiet Water. Feldred led to the east, Orronil to the south, and Laenan to the west. Every hour, on the hour, Feldred hit three deep notes on his taämlin, followed by two quick high notes, then one more deep note. Off to the south Orronil answered in kind, followed by Laenan. Unless there was a kill, as the three groups fanned out in their respective directions, each hour was punctuated by the same communications, and in this manner they were able to keep track of each other. If a hunter was successful in shooting a deer with his bow, the leader toned his drum with a series of percussive hits that informed the others, as well as the home camp, exactly what was caught. The direction of the message told all which group had made the kill. Once enough game had been gathered, Feldred sounded on his drum the command to return, and the journey back commenced. Similar communications continued until all were back safely, and this allowed the camp to know almost exactly when the groups would arrive home. The repeating cycle of the days (Esa being the day of unfolding time; Fel, the day of the wild; Dhe, the journey; Celes, children; Ryn, watchful skies; Ono, battle; Eran, the hunter) continues on through the ever-changing weeks (Adin, the week of earnings; Dhallas, trial; Curufal, acceptance; Ramos, peace) and then through the months (Ascalya, new beginnings; Nielran, the friendship month; Linya, the golden month; Lasfal, the month of birds; Teilna, the faring month; Nalya, profit; Naeras, darkened hills; Celesfal, kinship; Laenna, the forest; Ranos, dusk; Dhertas, choice; Enya, flight). For example, one can see that Ono, the Day of Battle, can have a different significance depending on which week and month it appears in. From the Book of Lore: "The first of the year always fell upon the opening day of Ascalya, when the harsh winter season was finally at an end. It was held as a holy day, the time when all the winter's planning for the year's plantings went into effect." So, the first day of the first week in the first month would be Esa (the day of unfolding time) in Adin (the week of earnings) in Ascalya (the month of new beginnings). There is more to it. The culture of the Rammoth drum has a 215-year tradition corresponding directly to their calendar and their rhythmic placement in — and interaction with — the cosmos. Their entire rhythmic system is based on the days, weeks, and months of the calendar, with a unique pattern of beats and measures for every day, making 336 different bäls, or patterns. When a child is born, the bäl for that day becomes that child's "rhythm" for the rest of his life, a pattern that he would meditate on moments before awakening, in times of stress, while walking alone in the woods, and just before going to sleep. It is tied directly to the heartbeat and is considered a centering device. Once one locks-in to his heartbeat and bäl, it is almost impossible to go astray. Even in times of battle, historically the men of Rammoth were known to center on their heartbeats, using the bäl to drive them forward, never wavering from purpose or intent. And when the bäl of every warrior linked together in a unison heartbeat, woe to any enemy who stood in front of such a force! The bäl is a combination of beats and measures making up a rhythmic "fingerprint" for a particular day, a pattern that one carries with him for the rest of his life. Beats can be played many different ways, depending on how one strikes the drum. Just four techniques are: "bah" is an open-head hit with the palm of the hand, letting the drum resonate with a deep tone; "ba" is a four-fingered hit near the rim of the drum, letting the drum resonate, but shorter and higher in sound; "da" slaps with the fingers near the rim, but deadens the head; and a "tüg" is a dead hit in the middle of the head with the tips of four fingers. This mnemonic system allows one to learn and even "perform" a bäl in one's head, without even touching a drum (related methods can also be found in playing tablas and the mridangam in India). By knowing the physical nature associated with the name of each hit, one can visualize and hear "bah, ba-da-tüg, bah, ba-da-tüg" for example. Earth is crisscrossed with a web-like network of lines of energy, believed to have been created by Hermes, the Greek god of communication and boundaries, the winged messenger, the guide to travelers on unknown paths. Today, for example, aborigines in Australia can tune-in to this energy and traverse the entire continent following these lines, called ley lines. The early people of Rammoth possessed this ability as well, enabling them to follow unseen paths up mountain peaks and down through densely forested vales without getting lost. The key to sensing this energy is to feel its pulse, the internal "heart beat" of the earth. And it is this very heart beat that resonates within those who are true to their own paths that is the bond with nature, with the cosmos. Telganan and his people possessed the ability to entrain their inner pulse with the ley lines as they walked. When finding a powerful location where two ley lines intersected, it was important to meditate on the combined energies and ask for guidance. Rammoth men and women often returned to these sacred places with their drums to align the Earth's pulse with their own inner rhythms (bäls). Many elements came together in this ritual: the wood of the drum, the animal skin of the head, the physical touch of hands, the singing of the beats, and the pulses of the heart and earth — all of which united the entire forest in a state of perfection. Just before Telganan died, he commissioned his people to build a road that would unite his house with the Houses of Nildë in the eastern part of the valley. The path chosen followed a powerful ley line that naturally flowed over the best route to the east valley, crossing the river at a point where there was plenty of available stone to build a bridge. The elven King Culthon, who had befriended the People of Rammoth, gladly sent a dozen of his finest stonemasons to assist in the building of the bridge. Faledor and Rüthol, although not elves, accompanied the Twelve to lend whatever hand was needed in the task. The two friends had been rescued by the Elves long ago and had been taken in and housed by Culthon, and this is how they came to the Valley. At the end of each long work day, both elves and the men of Rammoth gathered in a clearing on the eastern shore of the river to drink of their ale and sing of their song. That point on the shore was an intersection of a north-south ley line of energy and the line that lead to Nildë, so the nightly gatherings of drink and song were imbued with a force and significance that was to hold a powerful effect on the people of the Valley for generations to come. Such was their custom of salubrious bonding and celebration on this spot that, once the bridge was completed and the road to Nildë open to travel, the men and elves decided to erect an ale house to commemorate their combined efforts in which future travelers could slake their thirst and encounter good cheer. They named it the Lin Taäm, the Inn of the Golden Drum, after the taämlin of which each man, woman, and child of the Rammoth played from before they could walk, and the symbol of life everlasting, the perfect substance, that which all imperfect metals yearn to become: Gold. The Lin Taäm became a favorite gathering place for men and elves alike. The walls were adorned with taämlins of various sizes, each sporting a design which portrayed a significant event in the history of the people. These drums were more generic and were used for common occasions, even loaned to guests for impromptu song accompaniments. With a full and joyous crowd oftentimes all the drums were down off the walls and in the hands of jubilant folk who sang on into the night, songs of battles past, heroic feats, and even bittersweet love. 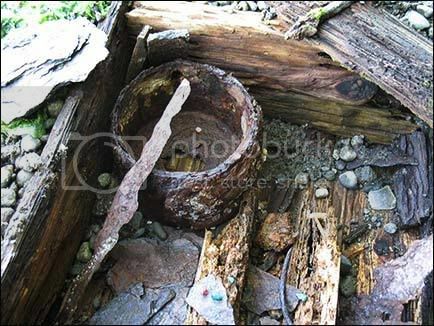 However, these drums were not the personal taämlins that were made specifically when someone was born, for those were sacred and not to be played by anyone but the owner, and when a person died, his taämlin was buried with him. The drum was placed over the heart to continue to resonate the deceased's inner rhythm on into the future to join with the ever-ringing pulse of all things natural, blending with the heartbeat of the world. It was believed that dying without one's drum left one's soul alone and forgotten, and a great void would be felt. The people of Rammoth deeply believed in the sacred value of every living being and appreciated the contribution and significance of each life to the whole. Encrypted in the design on the head of each person's taämlin, in addition to Ianar's flame, was the notation of the bäl, or rhythmic pattern, for the day of birth. The pattern might be encoded in a series of dots in a picture of a bird, for example, or may be portrayed in a numerical combination of characters. As mentioned in Part 3, each of the 336 days of the Rammoth year had a unique bäl corresponding with the pulse of the earth. The inner rhythm of a person born on Ryn (the day of watchful skies) in the week of Ramos (peace) during Laenna (the forest month) had an easy, but firm, onward quality, emulating the ever-vigilant nature of the forest creatures, yet retaining a settled and comfortable groove. Anyone meeting such a person immediately felt to be in the presence of someone in whom they could trust with their private thoughts and their own safety. Such was the person of Rüthol, although not of the Rammoth people and not a possessor of a taämlin. The day he came to Rammoth to assist in the building of the bridge over the River Nilren he was immediately trusted by all, and his inexhaustible energy and drive endeared him to both men and elves alike. Having already proved his mettle to the elven people during his time in the House of Culthon, he was considered by them to be one of their own; however, Ruthol never quite felt at home, being born of man and woman, and being one whose heartbeats were numbered. And so from the first day that he brought his talents to this new land, he knew he would live out his remaining days in the Rammoth: he knew he was now home. Telganan's people knew it as well. Here was a kindred spirit with whom they shared respect, morals, ideals, and an unswerving work ethic. Here was a man they could trust as one could trust a brother or sister. It was only a few weeks before Telganan died during the making of the bridge that he decided that Rüthol needed a taämlin, a drum aligned to his inner rhythm, the bäl he had been carrying inside him from the day he was born. A council was called to determine what day, week, and month their new friend came into the world so that one of their master craftsmen could call up the powers to guide his hands in the making of Rüthol's drum. The council met late one night far in the wilds of the forest after even the Lights of the North had gone to sleep. Five men and five women formed a circle in the darkness around a large boulder at the intersection of two ley lines. They used this spot for important meetings that needed critical guidance from powers deep in the earth, and the energy from these combined lines vibrated from sources far, both worldly and from without. Each of the ten was spaced from the other by touching the neighbor's fingertips with arms outstretched, and thus the Circle of the Council was formed. The deep black sky was darker than dragon's blood; not a single star could penetrate the midnight veil. With eyes closed, each man and each woman meditated on the birth of Rüthol while concentrating on their heartbeats, the bäl each brought to the Circle. As the inner rhythms began to mingle and align, the dragon's blood behind closed eyes slowly dissipated and a faint glow could be detected. The pulse of the earth and each of the ten bäls eventually became one. Without any outward signal, the five women opened their eyes and saw that the great boulder before them glowed as would crystal under a crescent moon. They unhooked their taämlins from their backs and began to softly play their combined bäls that up to now had only been felt. As the rhythm increased in volume, each man inhaled a full lung of air, held it, and then slowly released it while intoning a low monotone rhythm before opening their eyes and finally joining-in with their own taämlins. The boulder continued to glow from within, increasing its light with the rhythm. Each person was gradually led to alter his rhythm a note here, a couple notes there, until the group found itself playing one unison pattern, the bäl of Rüthol. Stars in the sky began to appear, revealing the stellar formation that would have been present on the cold predawn morning Rüthol was born: the day of Ryn in the week of Ramos in the month of Laenna. They continued playing until the moon covered the Star of Leodin's Belt, and then they knew they had accomplished their quest. Rüthol's bäl had been there all the time; they simply had to bring it forth. Faelin was one of the five women present at the Circle of the Council in which the bäl of Rüthol was revealed. Although he was not physically present, Rüthol was very much felt by all those in the Circle, but none more so than by Faelin, who had been enamored of him from the day he came to the Rammoth. Ten days passed during which Rüthol's taämlin was created. An uppermost branch from the tallest ash tree in the forest was chosen for its pliability to create the hoop, and the hide of the Great White Wolf that had killed Feldred was used for the head of the drum. It had long been washed of its evil and cured with a bath of oils and herbs and had lain in storage for just this sort of occasion. The head of Rüthol's taämlin was adorned with the constellation of his birth, the stellar map that the Council of Ten had seen that night while playing his bäl to the night sky. The very position and pattern of stars on the drum head revealed the rhythmic pattern of the bäl. Around the side were tips of Ianar's flame. The designs were inscribed using a dragon's tooth dipped in diluted dragon's blood, a small vial of which Telganan had brought so long ago from the cruel lands of the North. It had been given to him by his mother's grandmother, and it was her father (in a land of black horsemen and walking trees) at whose hands the mighty beast had met its fate. The ceremony for the presentation of the drum was held in a forest glen high in the mountains, far from any house or village. Telganan was in the waning days of his time on earth and was too weak to attend. The Council of Ten accompanied Rüthol to the glen. Faelin carried the taämlin wrapped in dried moss and fragrant juniper boughs. The glen was as quiet as a forest could be: the kind of quiet where one's own heartbeat is louder than the wind's soft caress of the tree tops and even the distant sigh of the River Nilren. Such was the setting for Rüthol himself to intone the first notes on his new taämlin and play with his own hands the bäl that resided within. The Council formed a circle in the same manner as did they ten nights earlier, with Rüthol in the center. Faelin stepped forward with a parcel wrapped in juniper boughs and placed it at Rüthol's feet, then returned to her place in the circle. With both hands, each member of the Ten held a taämlin at chest level and waited. Rüthol knelt down to remove the boughs, revealing the most beautiful drum he had ever seen. The constellation of which Ryn, Ramos, and Laenna were a part sparkled against the skin of the once-feared White Wolf, still mighty in the power it now endowed to the drum. Rüthol stood slowly and held the taämlin high over his head, saying, "With deep honor and gratitude I accept this sacred instrument. I am now One with the Rammoth." He then brought the drum down to his chest and, with eyes closed, softly began to play his bäl, the inner rhythm that pulsed through his body, the underlying heartbeat he shared with all things living. As he gradually increased in volume, the heads of the drums surrounding him began to resonate. Each of the Ten could feel Rüthol's bäl vibrate his own drum until it sounded as though eleven were playing in the glen, yet only one played that day. His bäl entered into the drums and hearts of everyone present and beyond. It sounded in the tiny body of the hummingbird as well as that of the mountain lion and elk, and it penetrated to the core of every tree in the land. Rüthol was now truly one with the universe. It has been said that a great void would be left in the collective pulse of the world were one to die without one's taämlin, for the drum — if placed on the owner's chest and buried with him — would continue to resonate the bäl into the heartbeat of all things past and present, and on into the future, imbuing the essence of the deceased's life into the ancestral memories of generations to come. So when Feldred passed into the World of the Elders, he joined all those in the Afterlife with his taämlin pulsing with a force as mighty as he was in life. His body had been discovered by two of Telganan's men who had been sent by Lenalin to find him after he did not return from fending off the evil wolves that had ravaged the countryside. His body was discovered lying flat on the ground with the great White Wolf atop him, its jaws at his throat. Each had smote the other in a final, cruel struggle to the death. Feldred's drum was strapped to his back, and though it was partly crushed under the weight of the two mighty hunters, it yet pulsed with the unmistakable bäl of its owner, enabling the men to find their fallen leader. Except for Lenalin and Nildë, who in their grief had fled to the woods, all of the Valley attended the funeral. At the graveside stood Telganan and Feldred's sister Faelin. For every man, woman, and child a taämlin adorned with colorful ribbons could be seen, and as the long procession of mourners passed Feldred's body, lying in his grave with drum at chest, each person slowly raised with the right hand a taämlin high in the air, arced it down to the knee with arm extended, then repeated the pattern, tracing the shape of the crescent moon. The effect was a long spiraling line of colorful and shimmering undulation, portraying the continuous thread of Feldred's spirit as it wove the fiery lineage of his ancestors through him on into those yet born. The circle shape of the drum head represents the cosmos, infinity, and that which comes back to itself — one, the individual. The circle is the unon of man and woman, and the never-ending revolution of possibilities. It signifies one's starting point, or birth, and the subsequent path through life; and as one continues around the circle, the path can overlap events, places, feelings that one experienced before. And so it happens with the rhythmic journey through life, the inner bäl that accompanies a person from birth to beyond the grave, the driving force that both makes someone unique and unites them with the world pulse. In drum notation, the people of the Rammoth used the circle as the starting point, the pure open tone that is the unique heart-note of each taämlin and that which every individual experiences when first laying a hand on the skin. It's the open-tone "bah" produced by hitting the head just off center with the open palm. The sound is the big, full-bodied voice of the drum with bass intact. Every part of the drum resonates, from every cell of the wood to the stretch — rim to rim — of the head. The circle represents the open-tone ring of the "bah," whereas a solid, filled-in circle indicates a "ba," the four-fingered hit near the rim of the drum, letting the drum resonate, but shorter and higher in sound. A downward-pointing triangle is a "da" which slaps the fingers near the rim, deadening the head; and a solid triangle is a "tüg," a dead hit in the middle of the head with the tips of four fingers. Each person learns the rhythmic pattern of his bäl by saying the syllables ("bah, ba-da-tüg, tüg ba-da tüg-tüg, ba tüg, bah, ba-da, bah," for example) while merely holding the taämlin without playing. At the same time, one must visualize both the technique for playing and the accompanying notation of the circles and triangle notes. In this manner, the person equates the "bah" with the circle and hitting the drum in the middle with open hand. All becomes one. Only when the recitation of the bäl is mastered can one then start to actually play it. In the weeks after the Council of Ten presented Rüthol with his own taämlin, he began to court Faelin. He had come to love her dearly, even had worked side by side with the woman while constructing the stone bridge over the River Nilren, for she was not one adverse to hard labor. He had watched her playing after long workdays in the Lin Taäm ale house during the festive nights of song (Faelin's drum had long since been repaired after her tumultuous finale during her Døm Danär initiation on the mountain — see Part X). She and many drummers led the Rammoth people and Culthon's elves in evenings of camaraderie, but it was the contrast of her gentle and intimate nature with her just-under-the-surface raw power that Rüthol was most attracted to. And so the couple nurtured and grew their love for each other until Ascalya, the month of new beginnings, when they were married on Celes, the day of children, in the month of Curufal, acceptance. Such beginnings bode well for the couple, especially when, not long afterward, Faelin became great with their first girlchild, soon to be known as Naomin. The couple spent many evenings together softly playing their taämlins while Faelin's belly grew. She and Rüthol linked their bäls in a gentle rhythmic undercurrent which began Naomin's introduction to the drum from within the womb. Without even knowing it, the bäls of Rüthol and Faelin combined into that of their unborn daughter as they played. The life force of their union that pulsed deep within Faelin rang outward into the head of each taämlin, and they could feel their child-to-be in their fingers, in their hands, up through their arms and into their hearts. They knew they would have a little girl. And so Naomin was truly born to the drum, for she had been hearing and feeling it for many months. She could even sing her bäl before she could talk, and it was only a matter of time before she was playing her own drum, given to her on the day of her birth from her older cousin Nildë. As Naomin grew into a young girl she and Nildë would disappear for hours into the forest and play their taämlins together on the many occasions that her mother visited her niece. While Nildë was the older of the two, Naomin taught her the techniques she had learned from her mother, one so skilled in the ways of the drum; and Nildë impressed upon her little cousin what is learned only from experience — the locking-in to a tempo, not straying for a moment, patience, and being transported with no effort to new levels of awareness. Faelin had come to the Valley with her brother Feldred as a skilled hunter herself, and as a highly skilled drummer as well. While all people of the Rammoth were born to the drum, Faelin's talent exceeded most. The dexterity and power in her fingers were unmatched and she could play for days, far beyond any who might try to compete with her endurance and creativity. When Rammoth children came of age they were initiated into another level of not only playing the taämlin, but of how they communicated with their inner bäls in terms of a guiding force in life. They had to gain a deeper understanding of their "center," the pulse at the core of their being which very often could determine the difference between life and death. The ritual which every Rammoth child endured was called the "Døm Danär." It consisted of a parent or grandparent taking the child, who had lived thirteen winters, into the mountains high above the valley to a rocky outcropping where the initiate would spend the next 33 days alone, with nothing but a supply of water and a taämlin. The elder blessed the young one and the journey on which he was about to embark, and then left, perhaps never again to see the one left behind. In three periods of eleven days each, the child would play the taämlin non-stop, except for Day One in which he merely sang his own bäl. At the first sign of light on Day Two, the child began to play the taämlin while still singing, and once the sun had fully emerged, the playing completely took over. For the rest of this eleven-day period the bäl was played over and over, speeding up, slowing down, gaining in intensity and descending into a whisper, but the bäl never stopped. The child played on into the night and into each morning. The inner heartbeat was married to the outer pulse of the drum, and all living creatures of the forest came to know this person intimately through the incessant voice of the taämlin. And while playing, the child became energized by the force within and forces without. The forest "fed" the drummer during his journey into the inner rhythms of nature. He began to experience visions, confront his worst fears, triumph over obstacles, and play to soaring heights of joy. In the second eleven-day period, he reversed the pattern of the bäl, literally playing it backwards. While the forward and outward playing in the first period introduced his bäl to the world around him, the retrograde playing allowed the flowing inward of external rhythms, the pulses of all other beings, thus infusing his presence with the world, all becoming One. On Day 23, and for the last remaining days, the little drummer played any combination of rhythms that come to him, having already experienced the collective life forces that he had experienced in the previous eleven days. It is during this period that he was truly united with the world. He wove his own bäl into those of others — his family, his ancestors — and the rhythmic tapestry that emanated from that rocky outcropping high above the valley was woven into the very fabric of life itself. It was during this time that pure joy was experienced, for the survivor of the Døm Danär usually emerged as a whole person, one better equipped to navigate life's cruel waters. To this new adult, ley lines would appear as glowing ribbons, the languages of animals and plants were felt from within, and one could stare-down a great bear and communicate that he is not a threat. As great and varied are the different individuals in the world, the same can be said for the myriad experiences one had during the Døm Danär, and each individual carried with him different degrees of effect and success. Not all conquered their demons during this rite of passage. In Rammoth history there is even one instance of a young boy not surviving the ordeal: he was found dead of fright after the 33 days had passed and he did not come down the mountain. Perhaps he was not of the mettle needed for the rigors of the world, for verily the weak and faint of heart did not survive the Døm Danär. In the case of young Faelin, she started the first day with eyes closed, only thinking her bäl, projecting it from her mind out into the rocks, stones, bushes, and trees around her. She held the taämlin in both hands while her inner pulse permeated even the birds that happened to come within range. Then, with an almost inaudible whisper, she began to sing the beats as she saw them in her mind, as she felt them pulse in her body, and for the rest of the day and night she sang her bäl to the world, and her drum vibrated and shook so much that at times she had to grip tightly to hold onto it. Faelin's fingers were so straining to play that, when the first light finally incised a slit through the ink of night, both hands ferociously attacked the drum in the fiery rhythm that had racked her body for hours. Small creatures who up till then had somewhat gotten used to the punctuated singing jumped with surprise at her explosive playing. There was nothing subtle about Faelin the little girl, and certainly there would be a force to contend with once she emerged a young adult on the other side of the Døm Danär. During the final week she stood on the rim of a festering volcano, her powerful hands unleashing from the taämlin ringing vibrations from distant constellations down into the broiling earth's maw and trampling any possibility of eruption. For days she faced-down the angry furnace, and finally the ravaged mountain cooled under her spell and settled to a quiet whimper. She tamed the wildest of animals. None dared come close and all respected her. It was also during this period that Faelin's possessed fingers ripped the taämlin's head to shreds, but she kept on playing. She used sticks on rocks, and the mountainside became her instrument. Each stone sang with a different tone under her blows. Faelin's "song" echoed throughout the entire valley, and not a soul below who heard this final onslaught doubted for a moment that this girl would survive the journey. On the last day the entire rocky outcropping began to shake with her playing and pieces from the underside shook loose and fell below. She moved upward as rocks gave way under her feet, never pausing or wavering in her beat. With the pinnacle in sight and with the sun sinking towards its bed on the horizon, Faelin continued playing the stones, playing her own path, and finally she emerged at the top of the world exactly at sunset. She came to the end of the final phrase of her bäl and hit the last beat on the uppermost stone of the mountain. Although she had finished her playing, her bäl continued on outward in all directions, penetrating every single being, creature, stick, and stone to the ends of the earth. Everyone now knew: Faelin the Woman had arrived. The Døm Danär, the sacred coming-of-age initiation that all Rammoth children experienced, served another purpose besides communicating with and refining the inner bäl. For boys, the personal journey into themselves and how they related to the inner and outward rhythms of the world included identifying and embracing that which is gentle, nurturing, and intuitive. It is called the "muethra" — or the "female" inside — for without it the young men would continue on into life guided only by their warrior instincts and their purely analytical way of thinking. Most boys initially saw the Døm Danär as a heroic quest, a contest which only the fierce could endure, and that usually reflected in their playing. They gripped the taämlin as a weapon against the world, their playing being an aggressive shield to any foes they might encounter as their journey began. In the course of only a few days and nights, however, a transformation would occur in which the young initiate began to realize that he was a part of the whole, that the critters out there — big and small — lent their energies to his and even aided him, almost protected him, in his quest. There were terrible moments, for sure, when his worst fears seemed to manifest in real objects and beings. One who was terrified of rats, for example, might find himself surrounded by giant rodents bent on tearing him limb from limb, and his playing became more fierce and frenetic. If the process was truly working as intended, he would gradually realize that steadfast playing by focussing on his bäl allowed him to communicate with those "demons," thereby rendering them impotent. Another aspect was at work. Yes, by concentrating on the inner bäl and by centering and aligning oneself with the confluence of natural forces, one could see his demons and fears for what they really were — or were not. But in doing so, the young boy was also tapping into his gentler side, that most-often hidden part of him that he reserved for petting a tame rabbit or hugging his mother. Feelings and intuition were allowed to reconsider what it was that he feared the most, often rendering it harmless once he played his bäl into and through the force. The old, outward terror became a newly-perceived, inward source of strength and understanding. Those giant rats were reduced to harmless forest creatures with whom he could align his own powers. It was just this sort of newly gained insight that turned one's raw strength into powers of intelligence and intuition. And each girl, although being taught in the ways of the bow and sword, as well as in the hearth and home, approached the Døm Danär with less warrior instinct than the boys. Their more natural sense of nurturing and intuition served them well in the beginning, but it was through the encounters with their fears that the more aggressive "male" strength — or thorra — was developed and mastered. They discovered sources of aggression and endurance that they were able to harness, making them a formidable match to any man. As stated before, not all survived the Døm Danär, and it was mostly during the confrontations with the unknown when they faced the most crucial test. What is fear? Is it the height of a mountain? the jaws of a ravenous wolf? or the frigid depths of a dark lake? As each child would encounter, the worst fear of all was the unknown — that which no word or idea could define. There was no face, no form to identify it, yet its terror was bottomless. And the only defense was the power of harnessing one's bäl through the incessant playing of the taämlin. That wall of rhythm, aided by all other forces one could muster, became the one and only instrument by which the unknown could be identified and tamed. Once the thirty-three days were finished, the young one emerged much better equipped to function as a whole person in life's journey. Neither brute strength alone nor gentle intuition were enough for all situations, and even without drum in hand it would be possible to be centered by one's bäl in the thick of battle, while navigating the wilds of forests unknown, or even while bringing a new child into the world. The Døm Danär instilled into every fiber both an enormous sense of uniqueness and a oneness with all things living. 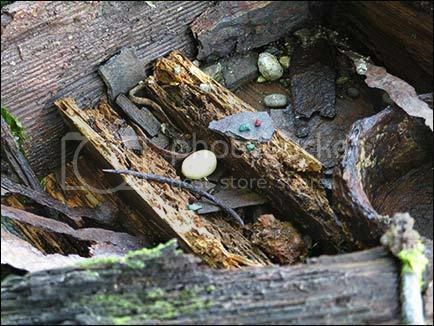 This cache of artifacts was recently discovered on the banks of the Galatea River which is believed to have been called the River Nilren long ago by inhabitants of the Rammoth Valley. 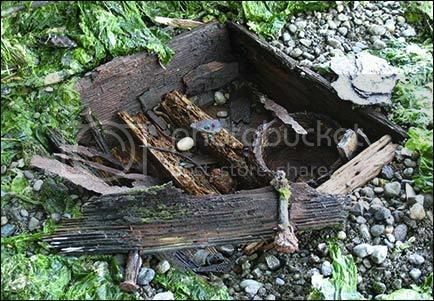 Not much is left of the lid, and the contents were encased in river mud of a claylike composition which has preserved much of the wood over the centuries. Great care was taken to remove the mud and leave the contents undisturbed as much as possible. Artifacts include a curved metal needle for sewing hides; some small turquoise gem stones; a white moonstone, known to have been given to young Rammoth girls when they completed a coming-of-age initiation called the Døm Danär; a tiny red nugget of cinnabar; rusty tools, including a knife blade, scythe blade, a metal arrowhead, a two-bladed spear head; and a small metal drum, which is perhaps the most significant find. The Rammoth people were known to have played the taämlin, a frame drum much related to the tär of India and the Irish bohdran that we know today. Although the taämlin was usually made out of a hoop of beechwood or fir and stretched with an animal hide, this particular drum being metal is extremely rare. The Rammoth people were not known to be particularly great metalworkers, but relied on the furnaces of the Elves for their source of metalware. 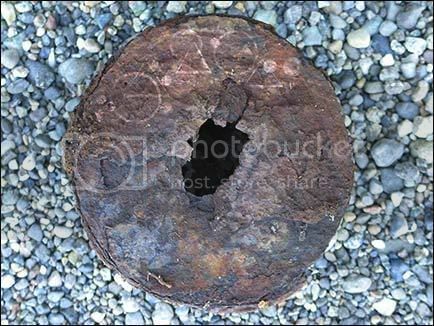 In this case, the drum in the above photo was most likely a child's drum, the head of which has long since disintegrated. Barely distinguishable markings on the bottom reveal a pattern of hollow and solid circles and triangles. Here can be seen some of the turquoise and the small piece of cinnabar. Bits of old knife blades litter the floor of the box. At center is the moonstone next to the curved hide needle. The blades on the right are a two-bladed spear head (probably more decorative than useful) and a scythe blade. A knife blade leans against the taämlin, and the piece of metal next to it was probably the handle. A closer look at the taämlin. The head would have stretched over the top, with the hole in the bottom for resonance. From other writings, this box seems to have belonged to Liita, the great-granddaughter of Faelin, and the granddaughter of Naomin. Liita's mother, Liina, gave birth prematurely, and Liita was not expected to live. These effects were to be buried with her and accompany her into the world beyond. 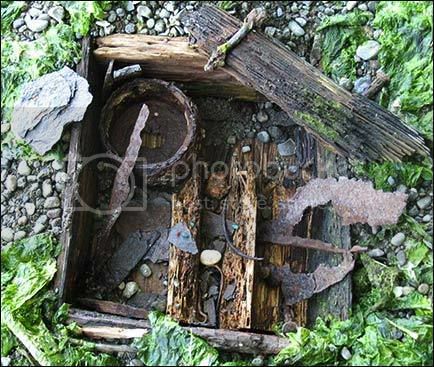 It is not known why the box was by itself in the riverbank. On the bottom of the metal taämlin one can barely discern circles and triangles, which would be the notation for Liita's bäl. The notation once continued all the way around, however, most of the bottom layer has rusted off.